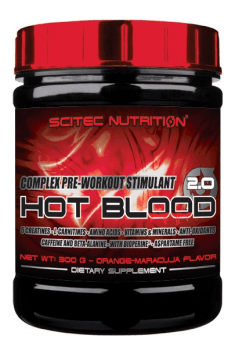 Scitec Hot Blood 3.0 is a complex pre-workout supplement, increasing the exercise capacity of the body and facilitating the effect of a training pump. It is a source of caffeine, vitamins, and minerals, and has advanced complexes such as Multi-Creatine Matrix, Hot Blood Multi-Complex, Amino Acid Matrix, and Anti-Oxidant Complex. Synergistic ingredients will effectively improve energy processes, muscle function and the functioning of the nervous system. It is a combination of up to five different forms of creatine, which include creatine monohydrate, Kre-Alkalyn® (buffered creatine monohydrate), creatine pyruvate, creatine citrate, and MicronTec (micronized creatine monohydrate). Creatine supports the process of energy production at the cellular level, giving in its phosphate group to the reconstitution of adenosine triphosphate (ATP). It is the basic energy carrier in the body, and thanks to the efficient process of ATP production, physical efficiency and exercise capacity become significantly increased. Creatine combined with citrate and pyruvate, effectively increases energy, strength and muscle power, because both compounds are mediators of energy production in the course of the Krebs cycle. Micronized creatine monohydrate and Kre-Alkalyn® are characterized by high bioavailability and high stability of creatine, effectively increasing its level in skeletal muscles. Glucose polymer – glucose molecules connected by chemical bonds. They quickly pass through the digestive system without causing discomfort, providing immediate energy that allows achieving better sports results. L-arginine alpha-Ketoglutarate – contains the ionized form of alpha-ketoglutaric acid, which is involved in the energy production and increases the bioavailability of L-Arginine, which when combined into one compound effectively raises the level of nitric oxide (NO) in the body. This allows relaxation of smooth muscle of blood vessels, improvement of blood circulation and obtaining the effect of training pump and vascularization. Beta-Alanine – a dipeptide that effectively raises the level of carnosine responsible for the regulation of the cellular pH level, thus contributing to the provision of the optimal environment for the biochemical processes and the delaying of muscle fatigue. Acetyl L-carnitine hydrochloride – participates in the transport of fatty acids inside the mitochondria, where they can be oxidized and used for energy purposes. The acetylated form of carnitine, passing the blood-brain barrier, increases cognitive abilities and the perceptible energy level, because it supplies the acetyl group necessary for the production of acetylcholine. L-Carnitine tartrate – supports hepatic fat metabolism and mitochondrial work, contributing to the increase of the body's ability to generate energy. It effectively increases the body's exercise capacity, extending the duration of the effort and lowering the subjective assessment of the effort’s difficulty. L-citrulline malate – the amino acid that effectively converts to arginine, and thus raises the level of NO and improves blood flow in the blood vessels, combined with the malic acid participating in the Krebs cycle. Sodium bicarbonate – i.e. baking soda, regulates the level of hydrogen ions and helps to maintain the appropriate pH level and delay the feeling of fatigue during the physical activity. Bioperine – black pepper extract containing a minimum of 95% of piperine, which by increasing the release of digestive enzymes and improving blood supply to the intestine, increases the absorption of nutrients. L-arginine hydrochloride – intensifies the production of NO, and thus reduces the energy expenditure during an exercise and allows extension of the workout. It supports muscle anabolism by increasing insulin sensitivity, as well as its release and accelerates post-exercise regeneration, resulting from the efficient delivery of nutrients to the muscles. L-Tyrosine – the amino acid used for the production of catecholamines (dopamine, adrenaline, and noradrenaline), responsible for motor coordination, agitation, and motivation. It helps to prolong the time of physical activity, maintain the clarity of mind during a stressful situation and increase cognitive abilities. Taurine – it is involved in regulating the concentration of calcium ions in cells that participate in the process of muscle contractility. It is involved in the transport of creatine to skeletal muscle and ensures optimal fluid balance in cells, enhancing their proper functions. L-ornithine hydrochloride – along with citrulline and arginine, it participates in the ornithine cycle, which is responsible for the conversion of toxic ammonia to urea. It helps to remove excess metabolites produced during a physical activity and to delay the appearance of fatigue, as well as it also has an anabolic effect, by affecting the level of growth hormone (GH). Green tea extract – containing 50% of polyphenols, which increase the level of NO, enhance the oxidation of fatty acids and remove excess oxygen free radicals. They reduce delayed muscular pain, have anti-inflammatory effects and improve cognitive skills. Grape seed extract – characterized by a content of up to 95% of proanthocyanins, which due to their high content of hydroxyl groups have strong antioxidant activity. It prevents vascular epithelial dysfunction, inhibits the collagenase enzyme and lowers cholesterol levels, contributing to the improvement of the functioning of the cardiovascular system. Alpha-lipoic acid – present in almost every cell of the body, it stabilizes cell membranes and is considered as a universal antioxidant. It strongly scavenges free radicals and reduces DNA damage, it prevents obesity and is used in the prevention of cardiovascular and neurodegenerative diseases. Caffeine – a purine alkaloid responsible for stimulating the body and the nervous system, it increases the level of catecholamines responsible for maintaining vigilance and willingness to act. By binding with the adenosine receptors, it reduces the perceived level of fatigue, thus extending the exercising time. It stimulates the lipolysis process and intensifies the use of fatty acids as a source of energy, thanks to which, in addition to increased power and muscle strength, it contributes to the improvement of body composition. Magnesium – an element that participates in over 300 different reactions in the body, it is necessary for the proper creation and use of ATP. It is involved in the process of muscle contractility and the signal transmission in the nervous system. Vitamin B3 (niacin) – it is necessary for the production of nicotinamide adenine dinucleotide (NADH), which is involved in many processes in the body that require oxidation or reduction. It enhances the release of NO and improves energy metabolism of skeletal muscles, allowing for a longer duration of exercise. Biotin (vitamin B7) – it is involved in the metabolism of energy components and obtaining energy from them. Thus it increases the energy availability in cells, which positively affects sports results. Folic acid (vitamin B9) – participates in hematopoietic processes as well as cell reproduction and DNA synthesis. It determines the proper course of the methylation process and has antioxidant potential. In conclusion, Scitec Hot Blood 3.0 is a multi-ingredient pre-workout supplement that increases energy production and nitric oxide in the body. It effectively increases the physical capacity and the ability to maintain the effect of vasocongestion and muscle pump. Advanced formulas help to provide the necessary ingredients to create ATP, regulate the pH level in cells and get rid of unnecessary metabolites and reduce the feeling of physical and mental fatigue. The complex keratin matrix allows to effectively saturate muscle with creatine, and the addition of vitamins and minerals ensures the optimal course of biochemical processes. Miałem okazję stestować - nie polecam. Pompa nieodczuwalna, pobudzenie nieodczuwalne. Miałem okazje przetestować orange juice oraz orange maracuja. Bardzo dobre w smaku, 30min po spożyciu pierwsze odczucia mrowienia, dodatkowego powera na treningu. Pompa mięśniowa OK, i brak zjazdów. 100% pozytyw dla tego suplementu. Bardzo dobra przedtreningówka, stosowałem wielokrotnie i jestem zadowolony z działania owego suplementu :) 30min przed treningiem zażyłem i już na samej rozgrzewce idzie odczuć działanie. Rozpuszczalność stuprocentowa. Polecam z czystym sumieniem. One portion in the morning on an empty stomach and one portion 30 minutes before training. One portion in the morning on an empty stomach. It will work well both in cyclical use, as well as only before training. The best price efficiency will be achieved when using the preparation only before training and in the morning applying a simpler creatine preparation without caffeine. It is worth starting from half a dose because of high caffeine content, especially among people sensitive to its effects. Guarana: Maltodextrin, Dextrose, Acidity Regulator (Citric Acid Anhydrous), Flavor (Guarana), Anti-Caking Agents (Tricalcium Phosphate, Colloidal Silicon Dioxide), Sweeteners (Acesulfame K, Sucralose), Colors (Carmoisine**, Ponceau 4R**). Tropical punch: Maltodextrin, Dextrose, Acidity Regulator (Citric Acid Anhydrous), Flavor (Punch), Anti-Caking Agents (Tricalcium Phosphate, Colloidal Silicon Dioxide), Sweeteners (Acesulfame K, Sucralose), Colors (Carmoisine**, Ponceau 4R**). Orange juice: Maltodextrin, Acidity Regulator (Citric Acid Anhydrous), Dextrose, Flavor (Orange Juice), Anti-Caking Agents (Tricalcium Phosphate, Colloidal Silicon Dioxide), Color (Paprika Extract), Sweeteners (Acesulfame K, Sucralose). Blue guarana: Maltodextrin, Acidity Regulator (Citric Acid Anhydrous), Flavors (Guarana, Milk Caramel), Sweeteners (Acesulfame K, Sucralose), Anti-Caking Agents (Colloidal Silicon Dioxide, Tricalcium Phosphate).